As we are about halfway through the semester, our fall athletic teams are pushing through towards the end of their seasons with great determination. Bay Path’s cross country, volleyball, and soccer athletes have been hard at work with just one thing in mind: victory. Cross country’s opener in Southern Vermont Mountaineer Invitational finished fifth out of eight teams. They were led by first-year Briana Serrao, finishing 13th with a time of 24:55. 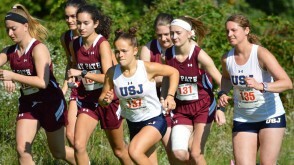 They came away with their first win by defeating the University of St. Joseph, Connecticut, in the Blue Jay Invitational 5K race. Led by Serrao finishing in third place, with Megan Bachand and Kamryn McCorison following closely in fourth and fifth place. Haleigh Bassett and Anna Austin followed them, finishing in sixth and seventh place to help bring the Wildcats home with a victory. Bay Path had another team finish at the James Early Invitational 5K Race. Led by Serrao again finishing in 129th place out of 215 runners. Briana Serrao seems to be the runner to look out for, as she has been a consistent lead in Bay Path’s races. Volleyball had a slow start to the season but came back around to sweep the pair of matches against Castleton State University and NVU-Lyndon. First-year middle hitter Lydia Clifford led the way against Castleton with 12 kills and six blocks, 14 assists, and five service aces. Senior setter Lexi Cears chipped in with seven kills, eight assists, and nine digs. The Wildcats continued with a 3-0 win against NVU-Lyndon to finish off the day with two solid victories. Despite their loss against NECC opponent Eastern Nazarene, Clifford topped the team with an impressive .333 attack percentage, while Cears led the way with 13 assists and eight digs. Bay Path went on to beat NECC conference teams Newbury College 3-1 and Lesley 3-1. The rest of the season is an important one, with the Wildcats competing against teams within our NECC conference. Soccer’s first win of the 2018 season comes from a 6-5 victory over Fisher College. In the second half, Jai Ruiz scored her hundredth career goal securing the Wildcats win. In their conference opener against Newbury, Bay Path clinched the win 2-1 with both goals scored by Senior forward Jai Ruiz. Junior goalkeeper Caitlyn Esposito earned her first shutout on the season helping the Wildcats with a 4-0 victory against regional opponent the Badgers of Northern Vermont-Johnson State. Soccer went on to win in overtime against MCLA, Ruiz scoring the winning goal with an assist from “Mack Attack” Megan Mackie. Check out a game before the season ends! As the fall athletics are coming close to the end of their seasons, our athletes are hoping to finish strong and enter post-regular season play. Come out and support our hardworking athletes and catch a game!